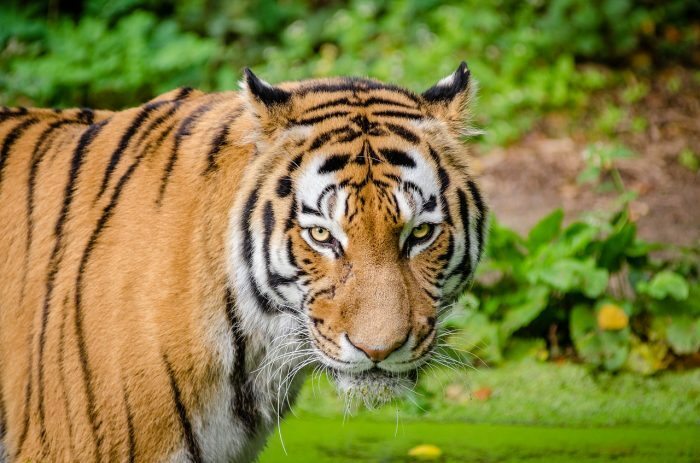 As of 2015, only six of the nine subspecies of tigers inhabit the wilderness or live in captivity in Asia and in the far eastern region of Russia. Bengal, Indochinese, Siberian, South Chinese, Malayan and Sumatran tigers still exist, but Javan, Bali and Caspian tigers have already died out. Tigers are the largest among members of the cat family. They are characterized by their powerful lithe bodies, which make them natural predators for many animals. Tigers typically hunt at night, usually lying in wait before springing a surprise attack on their prey. Deer, snakes, monkeys, boars, antelopes, dogs, leopards, water buffalo and even crocodiles often fall victim to the hunting prowess of tigers. Tigers generally lead solitary lives, only socializing during their breeding seasons. Pregnant tigers carry their young for 103 days, and they usually give birth to several offspring, from three to four cubs in a litter.